Plan of St Andrew's, Holborn from the 1720 edition of Stow's Survey of the Cities of London and Westminster... published by J. Strype. The plan features title in ornamental cartouche at top right and reference table down the left side of the plate. 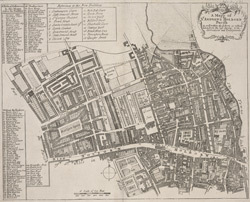 Lincolns Inn, one of the four Inns of Court, is shown in elevation. A pecked line encloses the parish.